The Mimaki JV34-260 is their latest grand format printer. Building on the success of the JV33-260, this is more than merely a facelift of the older model. When producing grand format prints there is usually a compromise between speed and quality. Now you can have both. 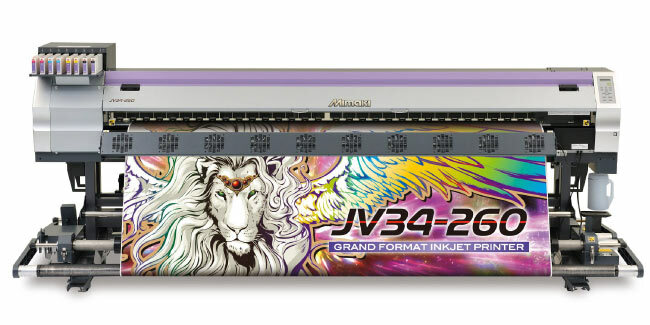 The new JV34 gives you the same class leading 1440 dpi print quality of the best selling JV33 series, but by doubling the number print heads - you get that quality at speeds not previously available. Two newly developed high tech print heads in staggered arrangement achieve a maximum speed of 30 m2/h. Benefit from a fast return on investment due to increased productivity and a very accessible price. Media up to a roll weight of 100 kg is securely controlled. Mimaki’s Automatic Media Feeder (AMF) maintains optimum tension even on long jobs. Smaller media are supported by the standard small take-up device that comes with the printer thus enabling full control of all substrates sizes. 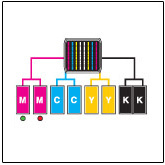 Mimaki’s UISS(Uninterrupted Ink Supply System) offers continuous ink supply. When one cartridge runs out of ink, the indicator will light up red, while the system switches automatically to the second cartridge, thus enabling long unattended printing. Optionally Mimaki’s MBIS(Mimaki Bulk Ink System) employing 2 litre containers in combination with UISS reduces your environmental footprint even further. The JV34-260 is fitted with a three stage intelligent heater improves the performance of ink and enables fast drying for high speed printing. The machine comes as standard with an automatic drying fan. In combination with the three stage heater, even at high speeds media is dried thoroughly so that it can be wound up immediately. Variable dot technology: By producing dots in three different sizes, smooth high resolution graphics are created without a grainy appearance. Head height adjustment: Head height can be adjusted to 2 or 3 mm. For sublimation, an adjustment of 3 or 4 mm is available. Water-based sublimation ink and solvent ink can be used in JV34-260, enabling a wide variation of applications, including signs, flags, banners, sublimation printing for polyester, etc. As with all Mimaki printers, a fully featured powerful Software RIP is supplied in the box. 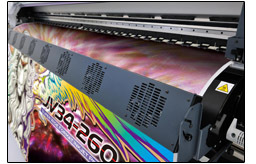 Based on the popular Wasatch SOFTRIP technology, Mimaki Rasterlink Pro 5 features 16 bit rendering, nesting, tiling, etc. With a full set of high performance profiles for you printer, Mimaki Rasterlink Pro 5 means that you get a fully featured production system out of the box. Manufacturers Specifcations for the JV34-260.